Occipital, a company best known for an app that lets users take panoramic photos from their phone, is looking to get into hardware. On Tuesday, Occipital is announcing plans for Structure Sensor, a 3-D camera that brings Kinect-style depth sensing abilities to the iPad and other mobile devices. Attaching such a camera to a phone or tablet paves the way for use in other contexts, including object scanning and augmented reality. Although Occipital is showing off the sensor on Tuesday, it won’t be ready for mainstream consumers until sometime in the middle of next year. The company is launching the product first for developers who order the device on Kickstarter. 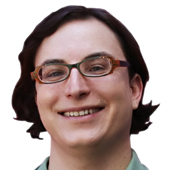 Doing so, said Occipital CEO Jeff Powers, will get the device into production quicker. Getting a consumer-ready product with three or four fully functioning apps would have meant waiting another year or more. Kickstarter backers willing to pay $500 for a developer kit will get a hand-assembled beta version by this December, while those who pay $349 can get a developer unit around February. The Structure Sensor is designed to fit directly onto an iPad to link up with its camera, but uses Bluetooth so it could be connected with other phones and tablets. Backers who pay $349 get to choose either an iPad or non-iPad version, while those paying $379 or more will get both attachment options. The hope is that the developers will not only serve as early enthusiast customers, but also help create the killer apps that will make the Structure Sensor worth it for consumers. 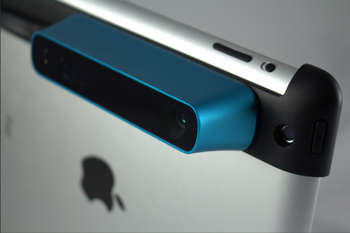 Occipital, which managed to cram PrimeSense’s full-size sensor into a mobile device, is likely to face significant competition in the market for mobile-compatible 3-D cameras. Intel talked at last week’s developer conference about including 3-D cameras into future Ultrabooks, while imaging-sensor maker PrimeSense has its own Capri sensor that is designed to go into smaller devices. Powers said that Occipital knows it is a small company likely to bump up against bigger competitors. But he said being small offers some advantages, too. “We don’t have to sell five million of these devices to succeed,” Powers said.